In this paper, the Decomposion Laplace-Adomian method and He-Laplace method are used to construct the solution of Klein-Gordon equation. In field theory, the description of the free partide for the wave function in quantum physics obeys to Klein-Gordon equation  . In addition, it also appears in nonlinear optics and plasma physics. is a nonlinear function of . E is a Banach space, where is a linear or a nonlinear operator, and u is the unknown function. where is linear, N nonlinear. Let’s suppose that L is inversible to the sense of Adomian with as inverse. 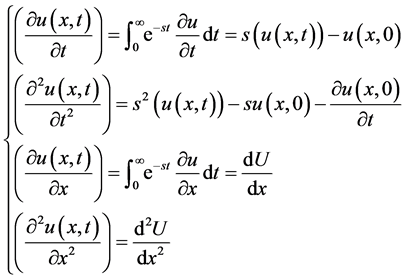 where are the Adomian polynomials of and it can be calculated by formula given below. The solution through the modified Laplace decomposition method highly depends upon the choice of and . N represents the general nonlinear differential operateur and is the source term. To demonstrate the applicability of the above-presented method, we have applied it to two linear and two non linear partial differential equations. These examples have been chosen because they have been widely discussed in literature. which is the exact solution of problem. which is the exact solution of the problem. Through these examplles, we showed again the usefulness of Laplace-Adomian Decomposition method and the He-Laplace method, in the search of an approximate solution of Klein-Gordon equation holds for the accepted forms of strong interaction of antiparticles in modern physics. 1. Behe, H.A. (2002) Modern Quantum Theory. 4th Edition, Freeman and Co., San Francisco. 2. Fadaei, J. (2011) Application of Laplace-Adomian Decomposition Method on Linear and Nonlinear System of PDEs. Applied Mathematical Sciences, 5, 1307-1315. 3. Abbaoui, K. (1995) Les fondements de la méthode décompositionnelle d'Adomian et application à la résolution de problèmes issus de la biologie et de la médécine. Thèse de doctorat de l’Université Paris VI. 4. Abbaoui, K. and Cherruault, Y. (1994) Convergence of Adomian Method Applied to Differential Equations. Mathematical and Computer Modellings, 28, 103-109. 5. Abbaoui, K. and Cherruault, Y. (1994) Convergence of Adomian’s Method Applied to Non Linear Equations. Mathematical and Computer Modelling, 20, 60-73. 6. Abbaoui, K. and Cherruault, Y. (1999) The Decomposition Method Applied to the Cauchy Problem. Kybernetes, 28, 68-74.